qTest Insights is a reinvention of software quality reporting. 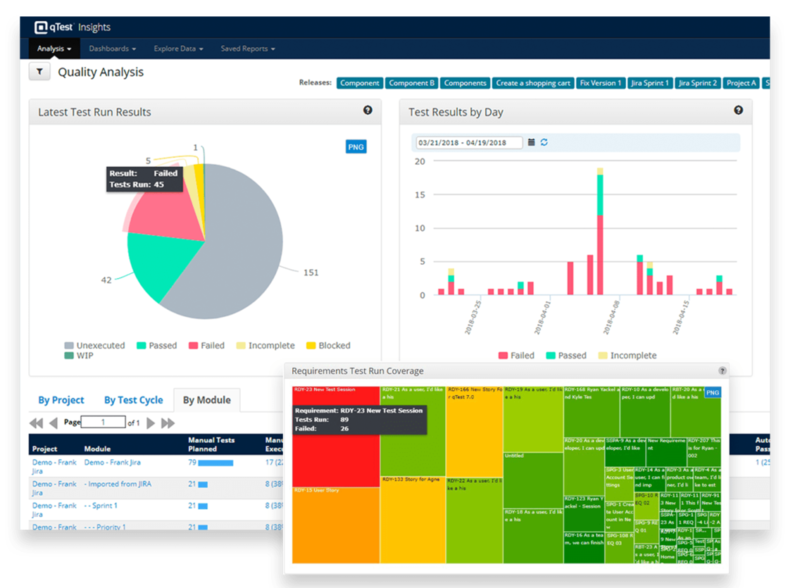 Insights gives Agile teams a single interface for analyzing application health, quality and release readiness across projects and teams. Accelerated release cycles make it difficult to provide visibility into QA activities. qTest Insights’ customizable dashboards and charts offer up-to-date snapshots of project status and overall application quality. Agile testing and development tools are often disconnected, which makes reporting across projects difficult. qTest Insights pulls data from a wide variety CI, test automation and ALM tools into a single reporting interface. Easily track the progress of your test cycles to assess release readiness. Quickly identify issues that still need to be addressed, and sort and filter data by object type and severity. Visualize the data you need quickly and easily with custom dashboards. Assess release readiness with real-time test data analysis whenever you need to. Offer testers a single interface for accessing test data, assessing release readiness and creating reports. Create a common set of dashboard reports that can be used by team leads, managers and directors across multiple projects, methodologies and teams. Create cross project reporting with actionable test metrics. Arrange and display charts and graphs exactly the way you want them for your project and executive teams. Tabs let you create multiple dashboards for different projects or teams. Visualize your data with interactive heat maps. Interactively sort and filter data by object type and severity to quickly identify issues, and drill down for additional details so you can quickly find and address risks. Gain valuable insights both within and across projects that help you improve application quality immediately and over time. Hover over charts to view specific test metrics. Zoom in to dynamically adjust the view, or click on a chart to view and download the data. Leverage out-of-the-box report templates for quality, coverage, velocity analysis and more, or build custom reports and dashboards to report on the metrics that matter most to your business. Create pie charts, bar graphs, scatter plots and many more. Report across your entire portfolio of projects with a gallery of pre-configured, cross-project reports. Quickly report on data across projects, including test run status, Jira defect status, testing progress and defect trends at the portfolio level, or by release or test suite.